These gorgeous cushions are made from the central panel of a vintage wedding blanket from the White Tai minority group. The White Tai can be found in China, Vietnam and Laos and are so called because of the colour of their dress. The textile is made from indigo dyed cotton warp and weft with a supplementary weft pattern in floss silk. The silks have a lovely muted appearance from the passing of time. There are zip fasteners and bespoke feather pads. 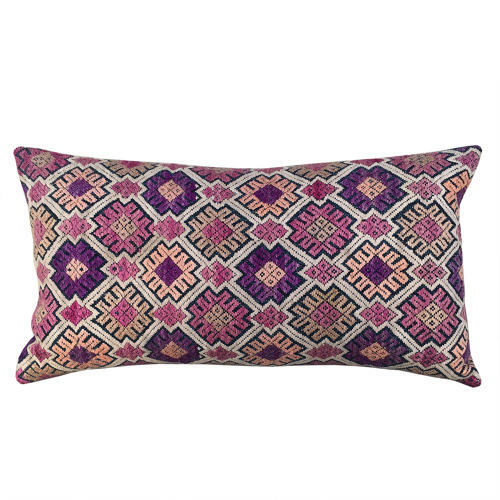 The backs of the cushions are made from a vintage cotton handwoven textile from another minority group, the Buyi. This is an indigo with thin white and purple stripes. The match is perfect! These cushions would look beautiful on a bed or mixed in with other colours on a sofa.